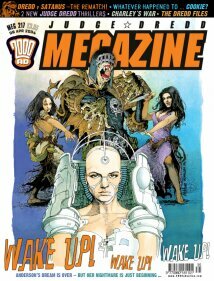 The Judge Dredd Megazine Odyssey: Meg 217 - Wake Up! To the stories, and Anderson Half Life concluded utterly brilliantly. It was definitely a story following on from another - perhaps in the Prog - but it didn't matter because it sent a chill through my bones. I have moaned about 3-4 issue stories finishing too soon, but this felt about right. Any more and it could have dragged on. I already felt Sandra should have taken a more direct route last time, but once she got with the programme and went for it - it was fantastic stuff. I can't really give you a synopsis without ruining a central plot line, but just read it! Satanus II Dark Matters also wrapped up this issue. I liked the ending. In Dreddlines Paul Glasswell (via email) suggested that Pat Mills was parodying rubbish Dredd writers in bits of this story. In my last review I derided some of the awful dialogue, but if Mills is indeed invoking the spirit of terrible writers past that would make an awful lot of sense. Still not too keen on the art, but I'm being very harsh here, as overall I liked it. The series of Whatever Happenned To... continued this issue with some robot chap called Cookie who I'm not familiar with. Still, it didn't matter, as the story was about Cookie being interviewed on a chat show about his past exploits and what he was doing now. It wasn't a bad story at all, and I enjoyed it being told in flashbacks. Si Spurrier was on script duties, and Roger Langridge on art (which was pens with grey wash added). I liked the more comic art style, I think it fitted well with the story. In the reprints we got a lot of Charley's War which was fantastic news. Another set of 'difficult' episodes for Charley, caught behind enemy lines. The old lump in the throat made a couple of appearances. It really is too good this strip. I just love it, and think it should be compulsory reading for school children studying World War I (and I'm deadly serious in that belief). We got two Dredds from Annuals (reprinted also in Judge Dredd Restricted Files 02). Ladies Night, set in 2108, sees Dredd requiring 3 judges to go undercover to flush out a gang of thieves and John Brown's Body, set in 2107, sees a rookie leave a perp chained to a fence in the most dangerous street in town! They are both Grant and Wagner stories and they are both pretty good from that era of prolific writing by those two authors. I enjoyed reading them. We were also treated to a bonus Future Shock Enemy Agent with art by the legendary John Cooper. It's not a bad little story of a secret agent determined to find who has been infiltrating his team. Of course, being 2000 AD, it's not just a simple spy story! Text articles had David Bishop continue his trawl of the Dredd archives in The Dredd Files (more like The Dead Files if you ask me - dead boring...) and Gordon Rennie's column You're Next Punk where he addresses the belief that all stories seem to be based of the premise of previous stories - i.e. nothing is new! I dunno how he keeps the pace up with these columns. He'll get bored at some point (or cancelled) because he's not doing them in the Meg today - so I'm enjoying them while they last.